Since Prince Harry first confirmed that he was dating American actress Meghan Markle, the couple’s every move has been documented and scrutinized. 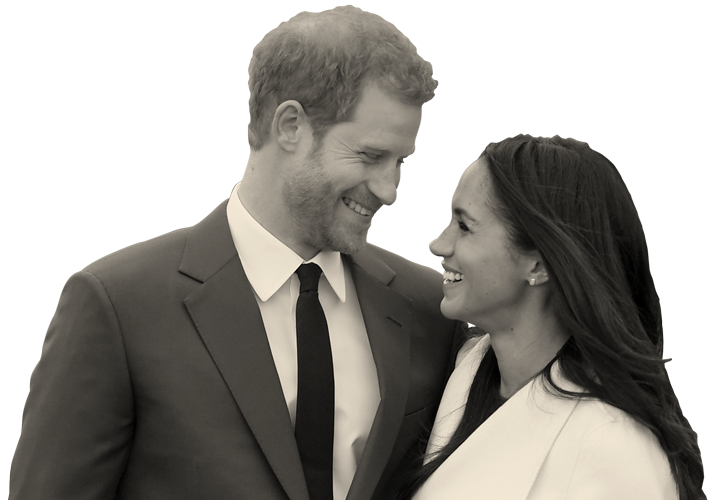 With the ceremony now over, CNN looks at what we know about their relationship, from a first date in London to their wedding at Windsor Castle, just a few miles down the road. Harry and Meghan go on a blind date in London after being set up by a mutual friend (as revealed by the couple in a post-engagement interview). The first date is quickly followed by a second the next day. Meghan visits Harry and camps out with him for several days during his trip to Botswana. The media and public are unaware of their burgeoning relationship. Rumors about the relationship first start appearing in British media. Some articles focus on Meghan’s racial background and her status as a divorcee. Harry warns the media against harassing his girlfriend in a strong statement issued by Kensington Palace. Meghan has been "subject to a wave of abuse and harassment," the statement says, and Harry is "worried about (her) safety." Britain’s tabloid The Sun newspaper publishes the first picture of the couple, taken while they are out together in London. Meghan watches Harry play a charity polo match. Pictures of the couple kissing make headlines the next day. In an interview with Vanity Fair, Meghan speaks publicly about her relationship with Harry for the first time. "We're two people who are really happy and in love," she says. Harry and Meghan make their first major public appearance as a couple at the Invictus Games in Toronto. Pictures of the pair looking happy and relaxed are soon splashed across websites and front pages around the world. The couple get engaged after the prince proposes during a "cosy night" in at their home in Nottingham Cottage, London – but they keep the news a secret. The engagement is announced via Twitter. Harry and Meghan make a public appearance in the grounds of Kensington Palace before recording an interview broadcast on BBC TV in the evening. Harry reveals he fell in love with Meghan "incredibly quickly." For their first official public engagement, the couple travel to the city of Nottingham -- somewhere Harry has spent a lot of time since first meeting with young people there in 2013 to explore issues around youth violence. Crowds of well-wishers turn out in the freezing cold to congratulate the newly-engaged couple. Kensington Palace releases the official engagement photos, followed by a candid picture taken during the shoot -- a "way to say thank you" for the "warm and generous messages" Harry and Meghan have received, the Palace says. Meghan joins Harry and the rest of the royal family, including Queen Elizabeth, for Christmas Day celebrations at the Queen's country estate in Norfolk. The couple visit a community radio station in Brixton, south London, for their second official engagement together. Harry masters an elaborate handshake and Meghan is praised for her modest choice of jumper -- a £45 ($63) sweater from high street store Marks & Spencer. The next stop on their UK tour is Cardiff, the capital city of Wales. They are welcomed by crowds of patient fans lining the streets outside the castle after train delays hold up the couple's arrival. Harry and Meghan attend an Endeavour Fund awards night in London celebrating the achievements of injured servicemen and women. The charity is a project of the Royal Foundation, the organization set up by Harry and his brother William. They take a trip to Scotland's capital, Edinburgh, visiting a social enterprise café and meeting crowds at the city's castle. Harry and Meghan (wearing ear protection) witness the daily firing of the One o'clock Gun from the top of the castle -- a tradition dating back more than 150 years. Harry and Meghan speak at a Royal Foundation event alongside the Duke and Duchess of Cambridge, the first time the so-called "Fab Four" have appeared together in public. Meghan promises to "hit the ground running" in her work to empower girls and women in the UK. On a trip to the city of Birmingham, the couple attend an event encouraging girls to pursue careers in science and technology to celebrate International Women's Day. Meghan and Harry attend a Commonwealth Day service in Westminster Abbey alongside other members of the royal family including Queen Elizabeth. The couple visit Belfast, Northern Ireland, the final stop on their tour of UK capital cities. They attend an event celebrating a youth-led, peace-building initiative launched by Harry last year and visit the city's famous Titanic exhibition. Harry and Meghan take a trip to the city of Bath for the UK team trials for the 2018 Invictus Games in Sydney. They watch as wounded or sick members of the armed services compete for places in sitting volleyball and in track and field events. During a gathering of Commonwealth heads of government in London, the couple meet young leaders from across the region. In a speech, Harry says he is excited about his new role as Commonwealth Youth Ambassador – and about Meghan’s role alongside him. Harry and Meghan attend a Women’s Empowerment reception hosted by UK Foreign Secretary Boris Johnson. The evening also marks the start of a campaign to support girls’ education across the Commonwealth. In a packed schedule, the couple attend a reception celebrating the upcoming Invictus Games (and are given their very own “Invictus Sydney” jackets) before going to a concert at the Royal Albert Hall to mark the Queen’s 92nd birthday. Live performers include Kylie Minogue, Sting and Shaggy. Harry and Meghan are guests at the memorial service of Stephen Lawrence, a black teenager killed in a racist attack in London in 1993. The killing shook Britain and led to accusations of “institutional racism” in London’s Metropolitan Police Service. The royal couple took up their seats alongside UK Prime Minister Theresa May. The couple pay their respects to Australian and New Zealand servicemen and women at a dawn ceremony in London -- and again later at a service in Westminster Abbey. Both wear red paper poppies, used as a symbol of remembrance in the UK since World War One. Buckingham Palace releases an image of the hand-written document officially recording the Queen’s consent to the wedding and signed by the monarch herself. It’s written on vellum -- a kind of parchment originally made from calf skin -- and decorated with flowers symbolizing the two home nations of the bride and groom. Harry and Meghan get married in St George’s Chapel, Windsor Castle. As the royal couple arrive in Australia for a two-week tour, Kensington Palace announces Harry and Meghan are expecting their first child together. The palace says the baby is due in the spring of 2019.